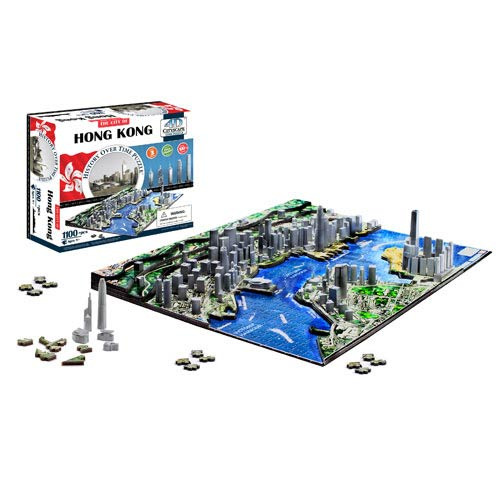 This Hong Kong, China 4D Puzzle from 4D Cityscape recreates Hong Kong's world famous skyline, not only in three-dimensions, using scale-model buildings, but also along the fourth dimension of time - spanning 98 years of architectural history! The puzzle includes 81 building replicas that depict the Hong Kong Skyline as it appeared as far back as 1912, through to 2010 with the completion of the I.C.C. International Commerce Center. The puzzle includes such iconic structures as the Tsim Sha Tsui Clock Tower, Hong Kong Convention Center, Bank of China Tower, and the I.F.C International Finance Centre. The base of the puzzle is a traditional 2D jigsaw puzzle that forms the city's street layout, islands, and mountains. During the process of constructing the base map, one learns about Hong Kong's neighborhoods, streets, ports, and more. Once the puzzle base is complete, the vertical building of Hong Kong begins by placing 81 buildings and skyscrapers in chronological time sequence. This is done by following the enclosed 4D Time Poster. Assembled measures 20-inches long x 16-inches wide x 4-inches tall. Ages 8 and up.